Barack Obama has won the 2008 presidential election. With his early lead in New England and the Midwest along with his victory in Ohio, he has essentially sealed the election against John McCain. At this point in time, he needs far less than 100 electoral votes to reach the 270 needed to win. 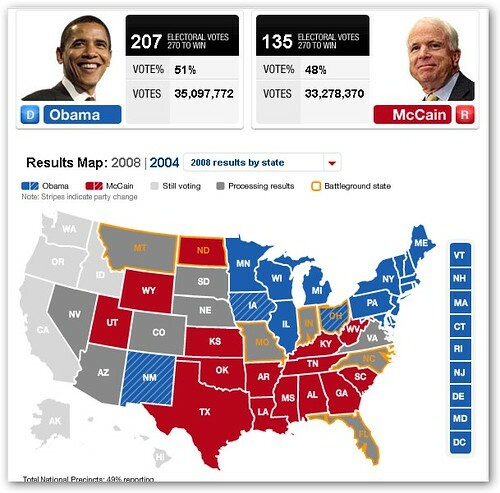 Even if John McCain sweeps the remaining red states, he will be unable to catch up to Obama's lead. In addition, Obama is leading substantially in Virginia, Florida, and North Carolina and is not far behind in Indiana. With his remaining paths to victory slim, McCain is almost certainly unable to catch up even though ballots are still being cast on the West Coast. Barack Obama will be the 44th president of the United States. Update: The major television networks have also projected Obama as the winner. Update 2: Watch Obama's acceptance speech.